Show&Tell is Tech Square's quarterly science fair-style demo day, which focuses on a different emerging technology each time. October's theme was BuiltTech. This $217 trillion sector is what shapes the future of planning, design, construction, and management of buildings, infrastructure, and cities. This lunchtime event occurred on Monday, October 2, as the kickoff event for BuiltTech Week. From 11am-1pm, attendees walked the exhibit floor meeting these companies and exploring their technologies: Pointivo, Konstru, Cognosos, Imbibe, Flourish Technologies, Quest Renewables, 3D Printing Technologies, and thyssenkrupp. In the middle of it all, four speakers gave their predictions for the next five years in the world of BuiltTech. Thanks to the Georgia Centers for Innovation, you can hear these Fast Forward talks from Bill Wilkins of Pointivo, K.P. Reddy of The Combine and Shadow Ventures, Sandeep Ahuja of Pattern r+d, and Dennis Shelden of Georgia Tech's Digital Building Lab. 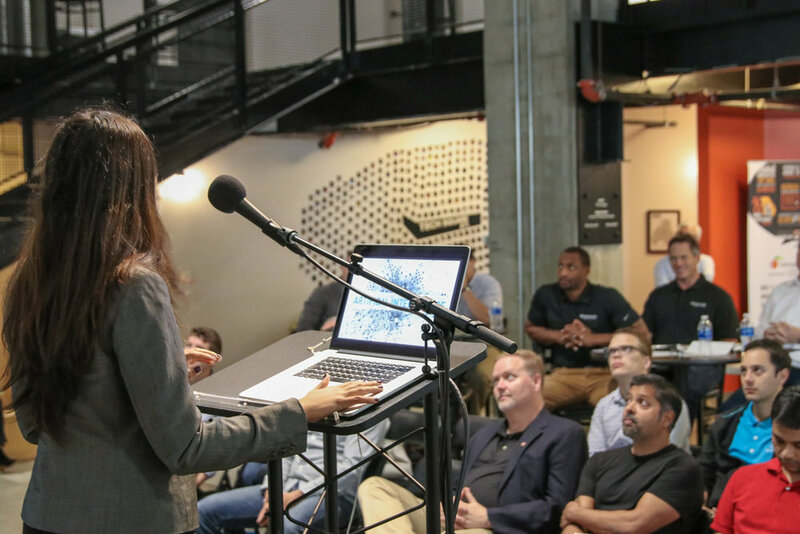 This free event was part of the first-ever BuiltTech Week, and was brought to you in partnership with Sandbox ATL, Georgia Centers of Innovation, and Honeywell.